Digital computers are superb number crunchers. Ask them to predict a rocket’s trajectory or calculate the financial figures for a large multinational corporation, and they can churn out the answers in seconds. But seemingly simple actions that people routinely perform, such as recognizing a face or reading handwriting, have been devilishly tricky to program. Perhaps the networks of neurons that make up the brain have a natural facility for such tasks that standard computers lack. Scientists have thus been investigating computers modelled more closely on the human brain. Indeed, technically its name is U.S. Route 50. It’s in Nevada, and it’s the loneliest highway in North America. Passing through semi-mountainous desert, it links Carson City and the town of Ely. A highway in which, it ought to be stressed, there is precisely nothing. Nothing. A 260-mile stretch with a brothel at either end. In conceptual terms, only one thing on the entire route vaguely calls to mind the existence of humanity: hundreds of pairs of shoes have been hung from the only poplar that grows there, the only one that found water. Falconetti, an ex-boxer from San Francisco, had decided to walk the length of it. He’d filled his green army rucksack with several gallons of water and a tablecloth to spread on the kerbside when it came time to eat. He went into a shop in Carson City, a supermarket with five foreshortened, ridiculous shelves. A stump, he thought, if these five shelves were fingers. He bought bread, a large number of freeze-dried sachets of jerky, and some butter cookies. He set off, passing through the city limits, leaving them behind; the silhouetted plateau rose up before him in the distance. The asphalt, fleshy, sank down in the 37ºC midday heat. After a time he came past the Honey Route, the last brothel before the desert commenced, and Samantha, a dyed brunette who was doing her toenails in the shade of the porch, acknowledged him in the same way she always acknowledged passing cars, trucks and pedestrians, simply wishing them luck, though on this occasion she also said: If you see a guy on his own in a Red Ford Scorpio, and he’s going to New York, you tell him to get back here! Falconetti pressed play on his Walkman and pretended he hadn’t heard. He instinctively quickened his pace, his feet sinking further into the 37ºC asphalt. He’d left San Francisco almost a month earlier, having been kicked out of the army. There, when he was still in the army, he’d read the history of Christopher Columbus, and, captivated by his audacity, had the idea of doing the same as him but in reverse: going from west to east. He’d never been outside of San Francisco before. As soon as he saw it he felt sure that it wasn’t a good thing, though it didn’t necessarily seem bad either. Strange. It was a shoe, a shoe thrown into the middle of the asphalt expanse. Neither 2 nor 4 nor 8, nor any other even number, but the odd number par excellence: 1. Billy the Kid, making the journey from Sacramento to Boulder City with his professional mountain-climber father, was used to travelling in the back bed of the truck among the 11-millimetre ropes, the Petzl harnesses and the large assortment of carabiners. The father, just Billy, had improvised a harness for the child, cinching carabiners tight on either side of the belt so he wouldn’t go flying on the bends. Billy the Kid was beaming. They’d left early that morning to be in time for the 3rd Boulder City Rock Climbing Competition: his father was taking part. They had breakfast at the first gas station they came to – the classic, deep-fried peanut butter and jelly sandwiches and coffee – and Billy the Kid, swirling the dregs of his decaf coffee, pictured his mother a few hours earlier when, at the entrance to the town, and possessed of a beauty that to the child seemed definitive, she had drawn his head to her breast before giving him a kiss. Like every Sunday, Drive safe, she’d said to his father after also kissing him. Billy the Kid slept in the back and when he woke, in the distance, stock-still on the asphalt like a rabbit without a litter, paralysed by the uncertainty that is a magnet to solitude, he saw it, a high-heeled shoe, brown perhaps from the desert earth, or perhaps actually brown. Neither 2 nor 4 nor 8, nor any other even number. Love, he thought, like trees, needs tending to. He couldn’t understand, then, why the stronger and sturdier the poplar grew in its 70.5 acres, the worse things became in his marriage. It’s logical that in a brothel there are all different kinds of women, and even more so here in the Nevada Desert, whose monotony, the most barren in the whole of the American Midwest, makes necessary certain exotic palliatives. Sherry’s having make-up applied in the ad-hoc backstage out back, beside the now dry well. She doesn’t trust the lightbulb-frame mirror they provided her with and, as when some client shows up unexpectedly, she glances in the rearview mirror of a rusted, broken-down Mustang. The sun and snow have been eating away at the vehicle since a man who was never seen again left it there. His name was Pat, Pat Garrett. He showed up one November evening, just as the temperature was about to drop, asked for a girl, the youngest they had, and Sherry stepped forward. Pat’s thing was collecting found photos, anything as long as it was found and featured a human figure; he went around with a suitcase full of them. When they were lying in bed together, as he gazed up at the wall he told her how he’d worked in a bank in L.A. before unexpectedly coming into an inheritance, at which point he’d quit. His penchant for the photos came from his time at the bank, from seeing so many people; he always found himself imagining what their faces would be like, and their bodies, in a context beyond the teller window – itself somewhat akin to the frame of a photograph. But after receiving the inheritance money, his other penchant, gambling, had seen him lose almost the entire sum. Now he was headed east, to New York, in search of more photos. Here on the West Coast, he said, it’s all about landscapes, but there it’s all portrait. Sherry didn’t know what to say. He opened the suitcase and began passing her photos. Picking one from the deck she was confronted with the unmistakable visage of her mother. She was smiling with her arm around a man who, Sherry understood, was the father she had never met. Her head subsided onto Pat’s chest and she held him tight. He stayed on for several days after that, during which time she stopped charging him, cooked his food, and neither of them set foot outside the room. The night Pat left he couldn’t get the Mustang started, but he managed to thumb a truck headed for Kansas. The next day, having discarded the possibility that he had fallen down the well or gone to Ely for cigarettes, she sat and waited until nightfall with her sight fixed on U.S. Route 50’s last divisible point. When she couldn’t take it any longer she wept, sitting on the bonnet of the Mustang. She checks her lips in the rearview mirror and the make-up artist gives her the call, 1 minute ’til we’re on air! Nevada TV are doing a special programme on freeway prostitution. Into the microphone they ask: What are you proudest of, Sherry? Love is a hard job, she says, loving is the hardest thing I’ve done in my entire life. In the middle of the Nevada desert stands a solitary poplar tree, covered in hundreds of pairs of shoes. Further along U.S. Route 50, a lonely prostitute falls in love with a collector of found photographs. In Las Vegas, an Argentine man builds a peculiar monument to Jorge Luis Borges. On the run from the authorities, Kenny takes up permanent residence in the legal non-place of Singapore International Airport. These are some of the narrative strands that make up this arborescently structured novel, hailed as one of the most daring experiments in Spanish literature of recent years. 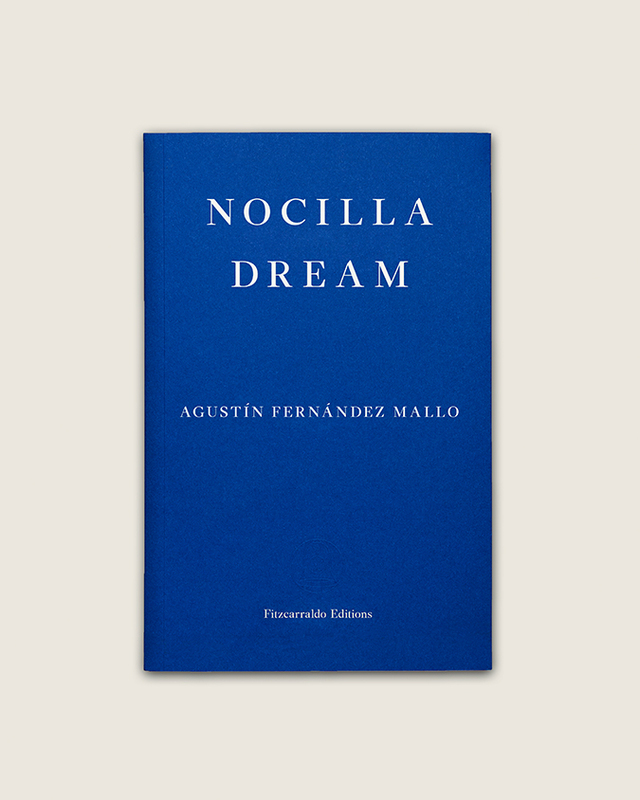 Full of references to indie cinema, collage, conceptual art, practical architecture, the history of computers and the decadence of the novel, Nocilla Dream finds great beauty in emptiness and reveals something essential about contemporary experience. Agustín Fernández Mallo was born in La Coruña in 1967. He is a qualified physicist and since 2000 has been collaborating with various cultural publications in order to highlight the connection between art and science. His Nocilla Trilogy, published between 2006 and 2009, brought about an important shift in contemporary Spanish writing and paved the way for the birth of a new generation of authors, known as the ‘Nocilla Generation’. He has also published a book of stories, El hacedor (de Borges), remake, and the essay Postpoesía, hacia un nuevo paradigma. His poetry is collected in the volume Ya nadie se llamará como yo + Poesía reunida (1998-2012) and his latest novel, Limbo, was published in Spain in 2014.